Good managers give their employees the tools they need to succeed. Keeping your sales staff on top of all the changes and challenges they face is a daunting task. Whether you have a veteran sales team or a new hire, it's imperative they have all the tools and information they need to succeed in selling your products. 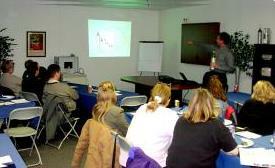 Valley Inspired Products offers high impact, focused training for your sales team and/or staff. Our comprehensive presentations are tailored to your needs. Our understanding of the clinical and technical aspects of respiratory products gears our training to the objective facts on all competitive products, clinical applications, customer needs, economic benefit and product positioning. Our customized programs answer the "So What?" question by giving your team the knowledge to effectively tell your story. Call us today and find out how we can help solve your training problems. HME providers are always looking for new equipment to help improve the quality of patient care and control expense. VIP has conducted research on respiratory care products used in the home and published the findings. Education programs have been developed from this research for presentation to home care providers to improve the understanding of how products operate and how the best outcomes can be obtained.